Unfortunately, I find many shop-brought falafel to be quite dry and disappointing. So I wanted to make a recipe that produced soft, moist falafel. I chose to bake instead of frying them, to be healthier and I think it worked really well! The trick was grated courgette! I had a huge glut of courgettes in my fridge and needed to use them up, so I grated one and added it to the blender with traditional falafel ingredients. The great thing about this, is that the moist courgette acts as a binder, so you don’t need egg – meaning these delicious balls of loveliness are vegan friendly! This recipe makes around 9 medium size falafels. 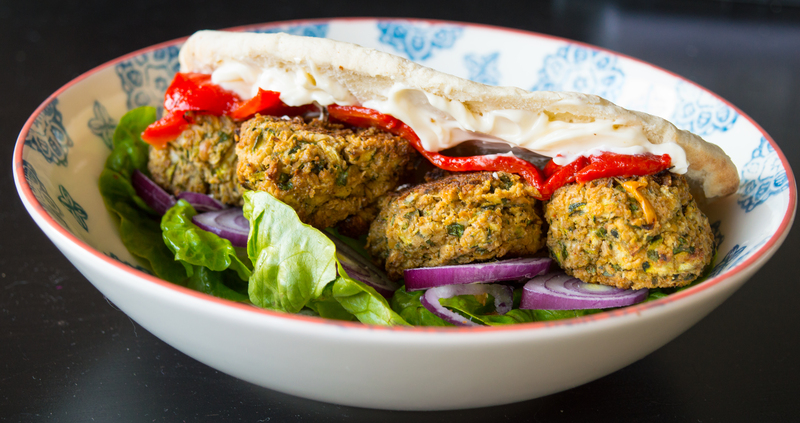 They are perfect for taking to picnics or serving as part of a meze-style dinner! 400g boiled chickpeas – do make sure the chickpeas that you use are cooked, otherwise you won’t achieve the right consistency. Preheat your oven to Gas mark 4. Line a baking tray with baking parchment. Grate your courgette. Place the grated courgette onto a plate and press with kitchen towel. You want to be aiming to soak up as much water as you can from the courgette – otherwise the falafel mixture will be too wet. Add the chickpeas and herbs to a blender and pulse until combined. Add the courgette and blend. You are looking for a coarse mixture. I prefer my falafels to have pretty flashes of green from the fresh herbs and courgette, so be sure not to over-blend it. Tip the mixture into a large bowl and add the flour and breadcrumbs. Stir until all the ingredients are combined. Dust extra flour over your hands and scoop out about a tablespoon of the mixture. Gently roll the mixture between your palms, into balls and place onto the baking tray – warning this can get messy! Keep dusting your palms with extra chickpea flour to prevent the mixture from sticking to your hands. Bake the falafels at Gas mark 4 for between 30 – 40 minutes. Be sure to flip half way through, ensuring both sides of the falafels turn a golden brown. Serve and enjoy! These little patties will keep for up to a week if kept refrigerated. Sprinkle with a bit of water and microwave for a minute to recreate that ‘just-out-of-the-oven’ soft texture. 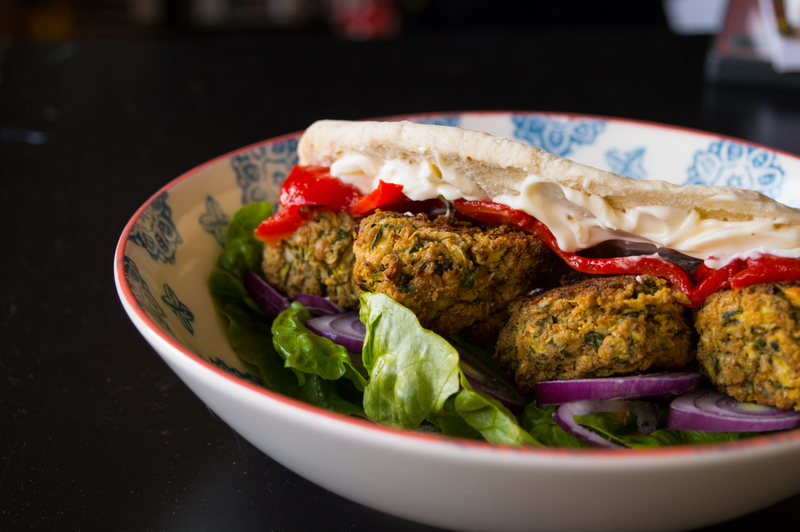 We recommend serving in pitta breads with lashings of Greek yoghurt, roasted red peppers and salad! Oh-so good! ENJOY! Posted on July 22, 2015 January 10, 2016 by TinaManahaiPosted in RecipeTagged bbq, chickpeas, courgette, fingerfood, Healthy, lunch, meze, north africa, picnic, recipe, salad, summer, vegan, Vegetarian.